All the daily pictures are on my Instagram feed – the latest are over in the sidebar, but if you want to see them all just click on the pictures in the sidebar (then click on Dreaming in Stitches), the Instagram icon, or HERE. 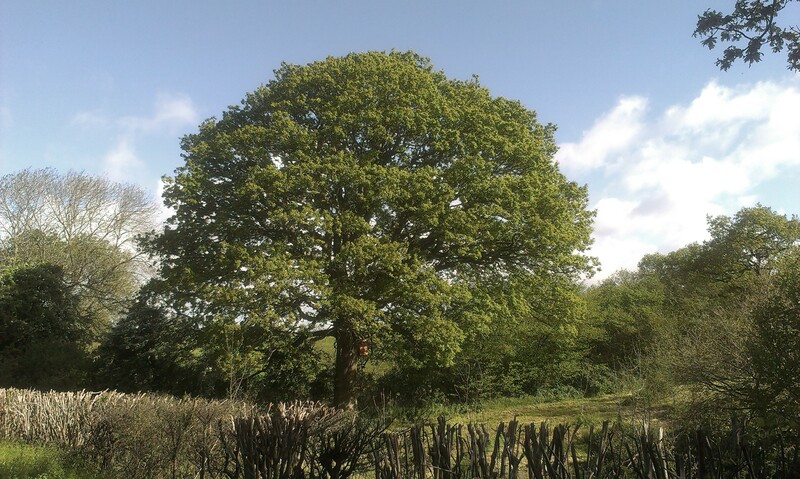 Nearly half way through the year and at last the oak is dressed in all its green finery. It’s my pleasure, I hadn’t realised when I started how much I’d enjoy doing it. Wow! What a difference! So fun to see! Thank you – and so pleased you suggested Instagram, I love it. Have you thought of making a time lapse video of your tree ? I was going to suggest using Pummelvision but it seems to have been discontinued. It would make a fab film. What a great suggestion, actually when I scroll through on my phone it sometimes gives me a sense of that, but I do like the idea – I’ll have to see how I could do it. Thank you. Oh yes, it was the shape that originally called me, it does look wonderful now. 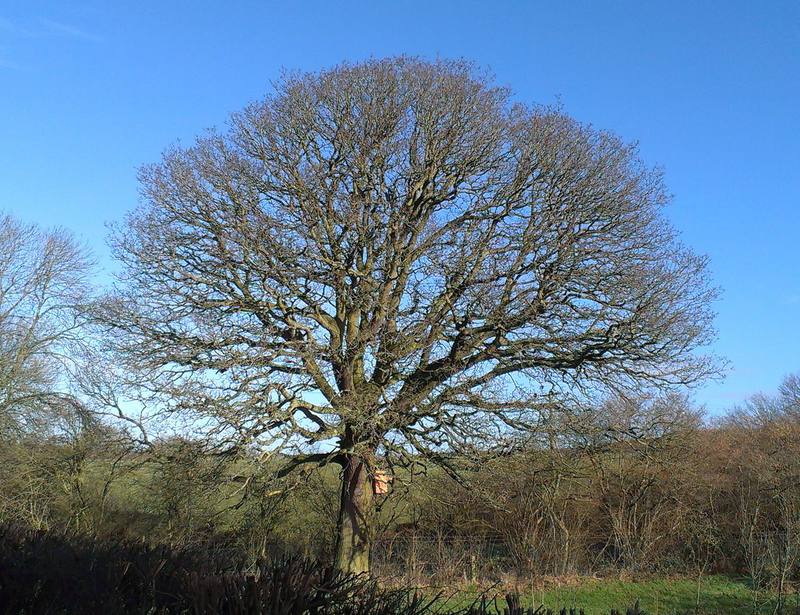 It looks very majestic in full leaf – I love it when trees can be allowed to grow to their full potential. I notice there is still a bare tree to the left in the background what might that be? And how unusual that the hedge is still bare…is that an Hawthorn hedge – it seems very late? 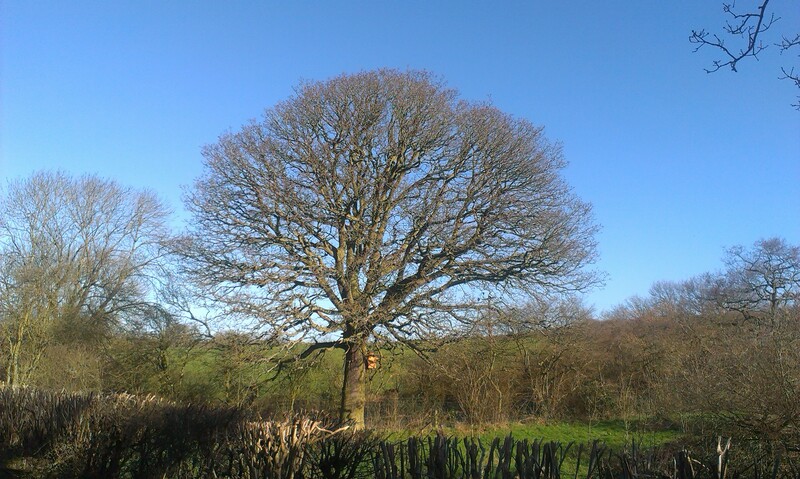 I believe the Ash came out before the Oak this year? Ah well, how perceptive of you! 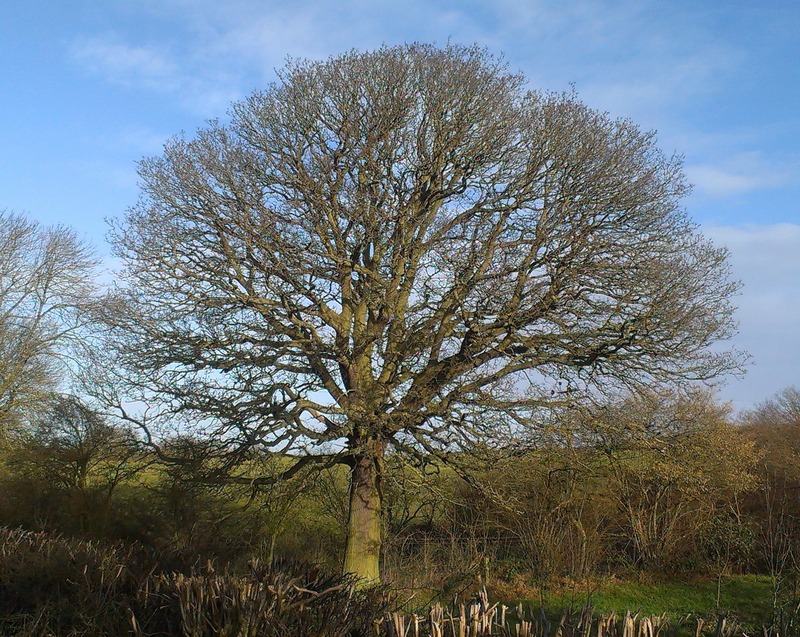 On the lane where this oak is, the ash trees were the last, and I think what you can see to the side is the ash just starting now to leaf up. 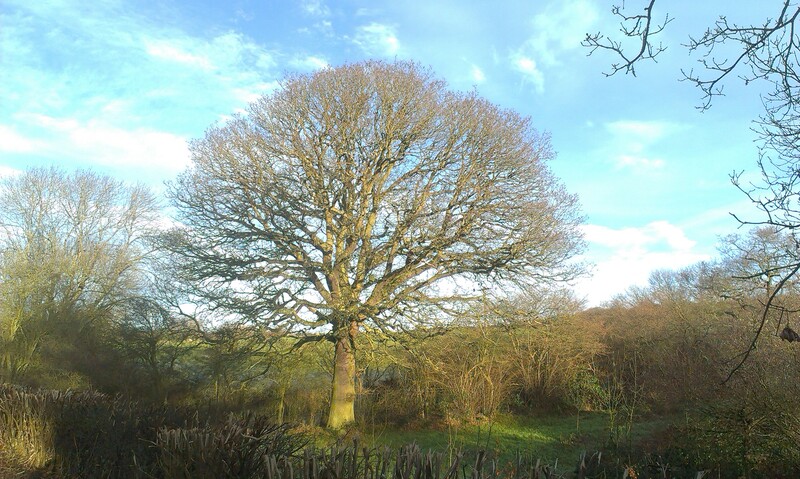 Although in the wood I walk through, there is an oak which has only just come out this week, much later than the others and behind the ash trees. The hedge in front of the oak – which is what stops me getting any closer – was mercilessly hacked by the mechanical hedge cutter last year. I took a really close look this morning and in places a few leaves are beginning to appear. I think it’s a beech hedge, although perhaps a hornbeam? Probably a beech – I’ll post the picture from this morning on Instagram – see if you can tell. I’ll take a look but I am not sure I will be able to tell from a photo. I can’t quite tell from the photo. A beech is darker and smoother – the hornbeam brighter green and more ridged I think. Keep meaning to ask, is that a bird nesting box on the trunk? If yes, is it occupied? Yes it is a huge bird box, which was put up a few weeks after I started the project. I keep looking, but haven’t seen anything around it. What a wonderful series, Anny, and a real credit to you! I love the idea in the comments, about creating a time-lapse video. As well as the foliage, it’s interesting to see how the shadows change and shorten as the year progresses. I can’t wait to see the coming months. Thanks Jo, – having downloaded so many photos of the tree so far – I take about three every day – it sort of makes sense to time-lapse it some how. I’ll work on that – something special to have for the end of the year perhaps. Such a good idea, detailing the changes that are so slow looked at every day, but so huge looked at as the bigger picture. Love it!